These conventions are intended to provide guidance for both layout and proper usage of various form elements. Designing an effective form requires consideration for its information hierarchy, sequence of form elements, clarity of labels, affordance, feedback, and accessibility. 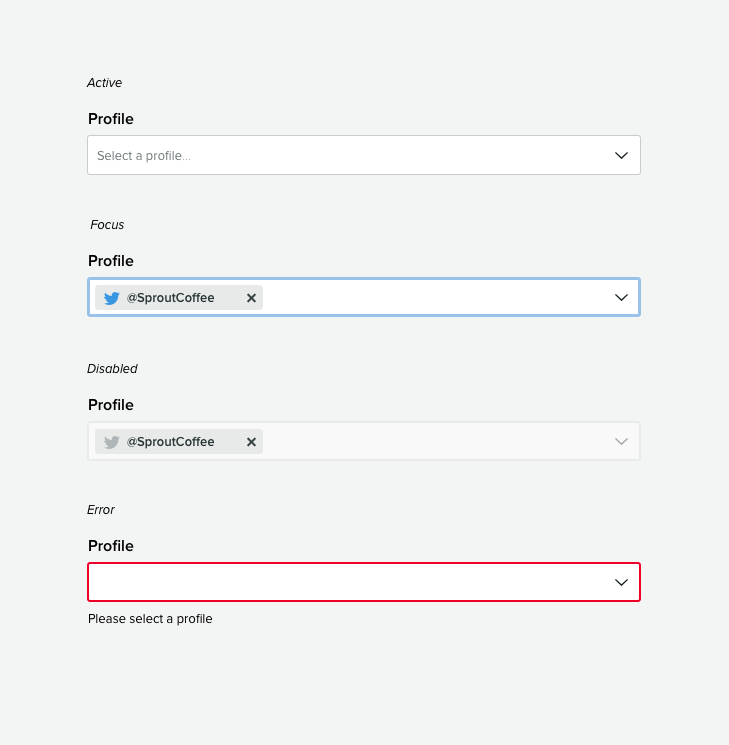 Form layouts organize input fields for our users to enter data and configure options. A form layout should be easy to scan, understand and complete. Forms should be one column in most cases. Multiple columns disrupt a user’s vertical momentum. In some cases, however, related fields may be grouped together in a single row. 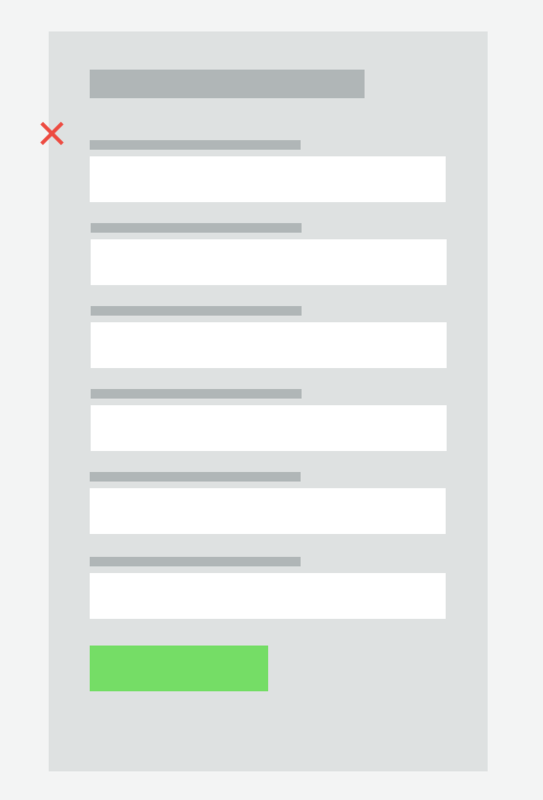 Every section of a form should have a section title. See content guidelines below for section titles. We only collect the data we need so most input fields within a form should be required. If you ask a user for optional information then ‘Optional’ text should be used to show that it is not required. The length of the text field affords the length of the answer expected. Employ this for text fields that have a defined character count like phone numbers, zip codes, etc. For mobile, pop the numeric keyboard when numbers are the required input. 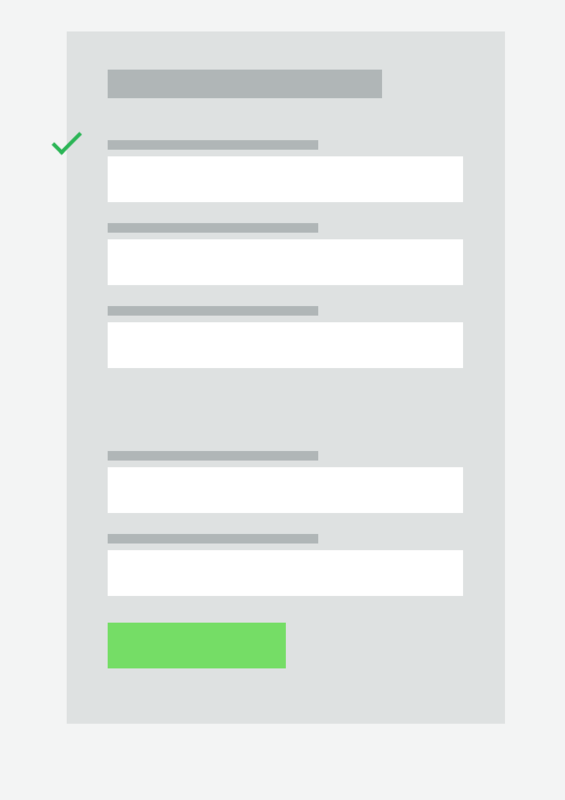 Place checkboxes (and radio buttons) underneath each other to aid in a user’s ability to scan the form. Use primary button type for main action and a de-emphasized style such as the secondaryinverse button or link style for secondary action. Form section titles should be informative, succinct and descriptive. Make final CTA button actions clear and descriptive. Differentiate between primary and secondary action text clearly. Helper text: Show basic helper text. Do not hide it. Expose basic helper text wherever possible. For complex helper text, consider placing it next to the input during its focused state. 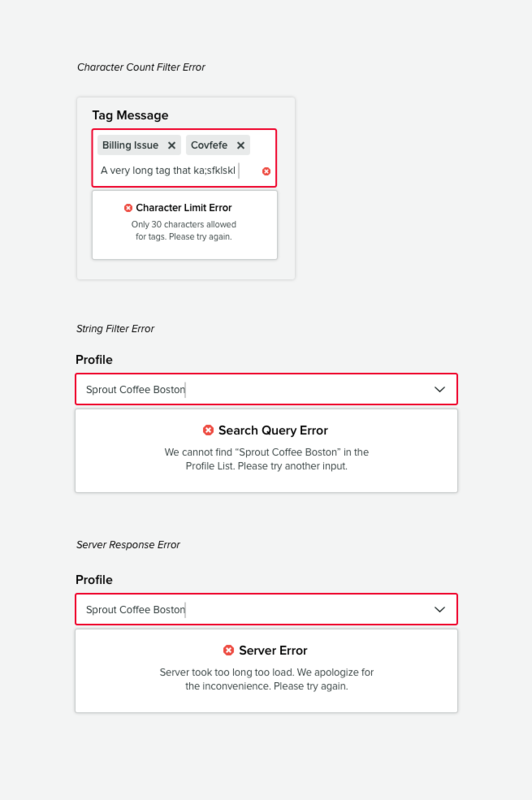 Inline validation: use inline validation after the user fills out the field. Don’t use inline validation while the user is typing —unless it helps them— like in the case of creating a password, username, or message with a character count. 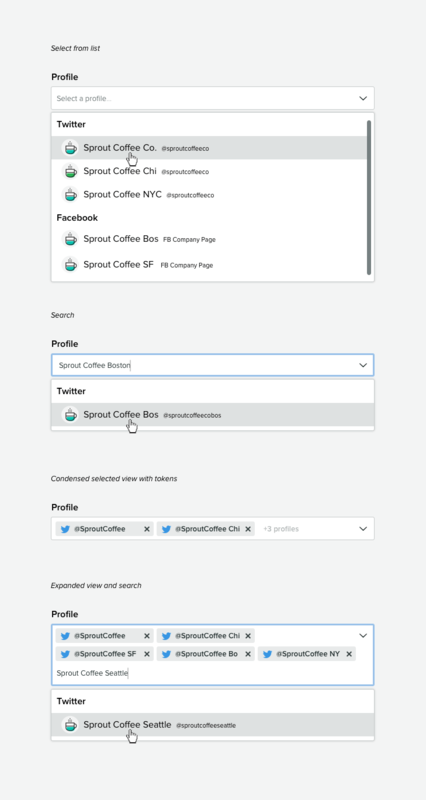 Multi-selects allow users to search and select multiple values —names, profiles, tags, etc.—from a list of options. 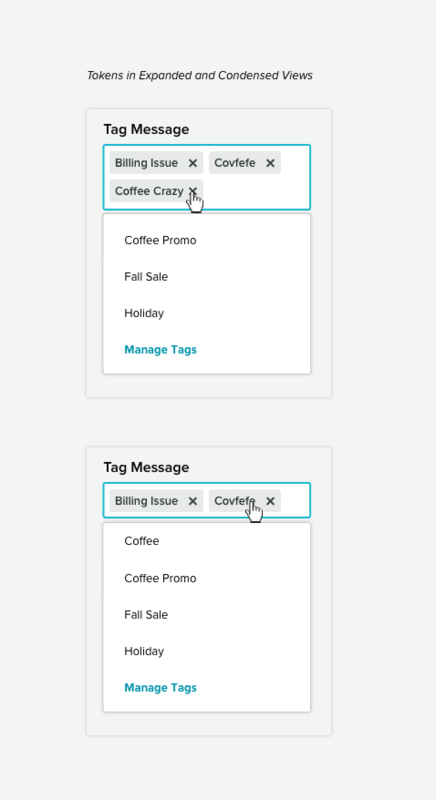 Selected options appear within a text field area, which could also be used as a search box to auto-populate from the database. Multi-selects and single-selects are a subset of drop downs. 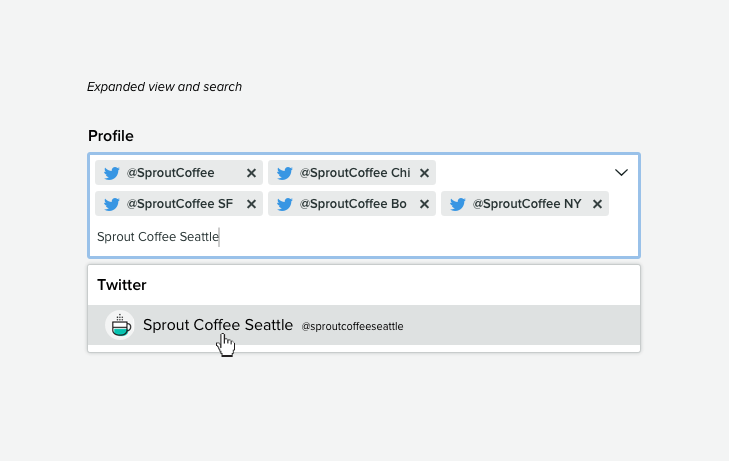 A single-select only allows you to add a single choice from a text field search. A drop-down allows you a single pre-selected choice. A multi-select input field follows the same rules as a drop-down and input field with the exception that it allows for multiple inputs such as tokens. 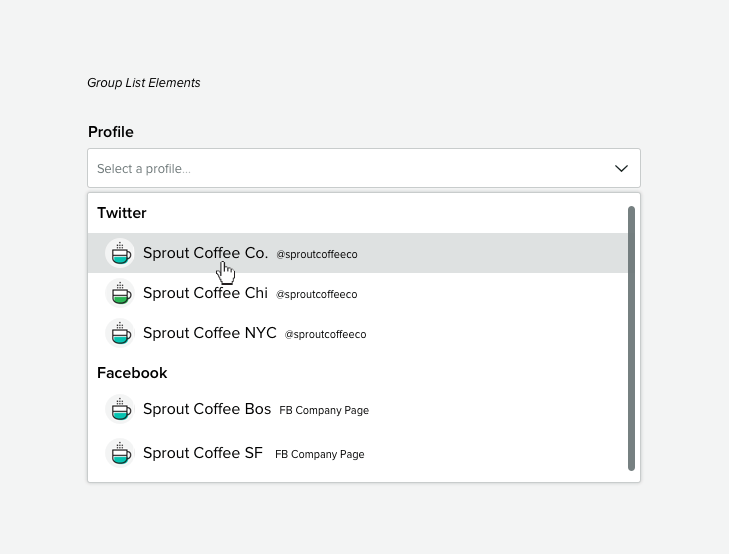 Filter search elements (such as profiles, names, etc). Condensed: The condensed view allows you to show the user that there are more inputs selected that are not displayed. Expanded: in the expanded view, users can search, enter a new value and add that new filtered search result to the list of selected elements. List items can be grouped within a multi-select drop-down menu. The use of titles within the list can separate grouped content. 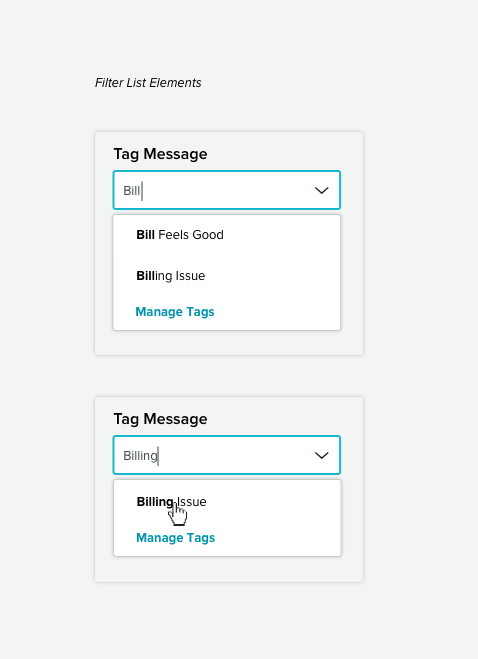 The following is an example of labels in a message tag component. When tokens go beyond the size of the select input, the input should expand to show the rest of the tokens selected. Error states provide immediate feedback to the user. DO: Group related information in a logical sequence. DON’T: Combine unrelated sections in large or complex forms. 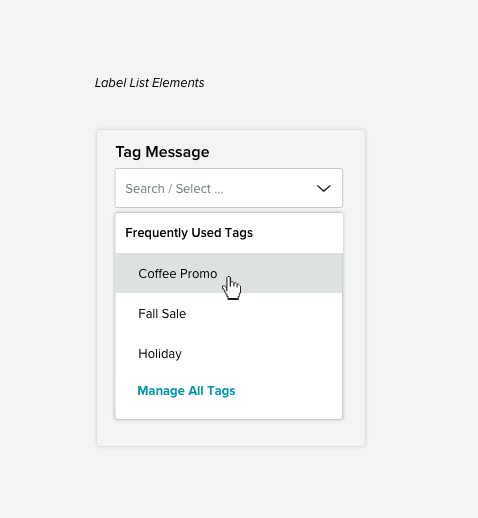 DO: Group labels closely with their text fields. 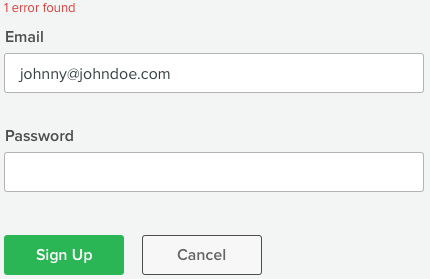 DO: Use labels to describe form fields. DON’T: Use placeholder text as an alternative to a label. DO: Expose basic helper text wherever possible. For complex helper text, consider placing it next to the input during its focused state. DON’T: Use tool tips for helper / requirement text. 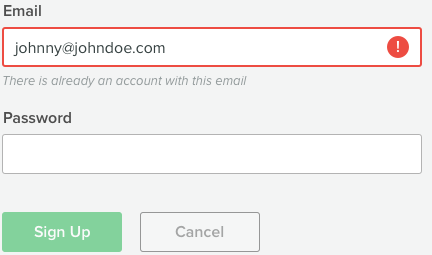 DO: Use inline validation after the user fills out the field. DON’T: Don’t use inline validation while the user is typing—unless it helps them—like in the case of creating a password, username, or message with a character count. DO: Show error message below form field, in subtle format. DON’T: Arbitrarily style or display inline validation. DO: Tailor the length of form fields based on the content.